Aussie Nationalist -> Does Nationalism Cause War? Although I’ve described the positive racial, civilizational, political and cultural duties to practice nationalism; there is one strikingly ubiquitous case made in opposition. This is the view that nationalism causes war, which is ceaselessly trumpeted by our cultural, political and business elites. French President Emmanuel Macron conveyed this much in his speech on the 100th anniversary of World War One. “By putting our own interests first, with no regard for others, we erase the very thing that a nation holds dearest: its moral values.” Macron further defended the “spirit of cooperation” and critiqued nationalism by foreshadowing a “sinister course… that could undermine the legacy of peace we thought we had forever sealed.” While predictably celebrated in the press, are these fair denunciations? In response, it is first worth establishing what ‘nationalism’ is. Nationalism can be considered a “political, social, and economic system characterized by the promotion of the interests of a particular nation, especially with the aim of gaining and maintaining sovereignty over the homeland.” This worldview is therefore devoted to protecting one’s own and can be epitomized through ‘America First’ or ‘Australia First’ slogans. Given this, nationalism is an unquestionably powerful and meaningful force. Subsequently, when core national interests are sufficiently threatened, resulting in tension may indeed provoke a war between nationalist actors. 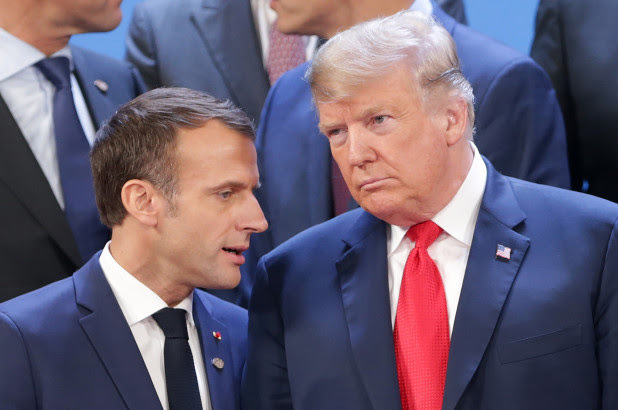 So while President Macron is not wrong that nationalism can provoke conflict, there are numerous caveats that accompany his globalist critique. As stated nationalism can cause war, primarily because it represents a powerful ideology. But without a powerful something, none of man’s inevitable evils can be effectively resisted. Besides the despotic Soviet Union, it was ethnostates–Canada, Britain, America, Australia, France, and others–that inspired people to make the sacrifices necessary for victory over the avowedly evil Nazi Germany. After nationalism within these countries has significantly decreased since World War Two, could one imagine another comparably fanatical commitment to combat any such future evil? Not by judging the present condition of Europe’s armies, that abysmally reflects upon the continent’s will to survive amid declining national sentiment. Was it not multilateralism and alliances, that converted a local conflict into World War One? Was it not multiracial societies divorced from traditional concepts of nationalism, that led to Hitler’s overtures into the Sudetenland, Memel, and Danzig, which culminated in World War Two? Was it not the amoral ethnic cleansing of Germans that lead to more homogenous European countries, which achieved a “lasting peace” desired by the Big Three at Yalta? Another complication with Macron’s account is that nationalists tend to oppose modern wars spawned by international elites. Present-day nationalists are inclined to avoid unnecessary wars, and identify problems related to properly discerning who the ‘bad guys’ are financial/ human costs, damage to soft power, the uncertainty of outcome; as well as the limits that race, religion, and culture can practically pose to fulfilling nation-building objectives. Noted critics of nationalism view these dilemmas rather differently. For instance, President George W. Bush intended to “end tyranny”, largely based off a purported concern for the world’s wellbeing. Considering the myriad of cultures, religions, peoples as well as values that can be used to interpret ‘tyranny’; this doctrine was and remains an endless prescription for conflict. As the President of France, I would presume Macron accepts a supreme military and political structure should unquestionably rule over the territory, to avoid the “state of nature”Hobbes famously described. But if nationalism is not to be our dominant governing preposition, it is axiomatic that an all-powerful transnational body should exist. Let’s imagine this transnational body that eliminated all interstate rivalries, and resembled a supreme world government, did indeed exist. If all people under this government occupied an equal playing field, there would follow unending conflict between groups for resources. From such instability, there appear to be two ways of making this world government viable again. First, this government could become more authoritarian than any regime in human history, to preempt and deter all possible outbreaks of civil war or unrest. A state more draconian than Soviet Russia, that rules over a tense, low-trust society is clearly not worth securing. Whether one places importance on Dr. Salter’s description, boils down to a simple question. Would you rather have something to fight for or nothing to live for? The former would seem a more righteous, rational and fulfilling state of being; as opposed to a deracinated, nihilistic state that nationalist opponents logically seek.